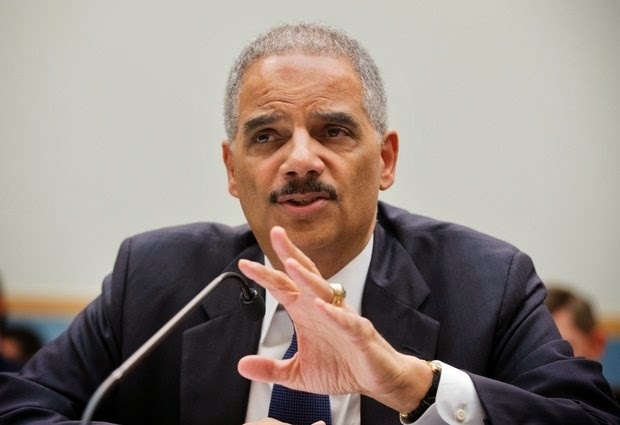 Attorney General Eric Holder testifies on Capitol Hill in Washington. An Internet connection and a stolen identity are all it takes for crooks to collect billions of dollars in stolen federal tax refunds, and the scam is proving too pervasive to stop. A watchdog report in November says the IRS issued $4 billion in fraudulent tax refunds over the previous year to criminals using someone else’s personal information. Holder said this week that the “scale, scope and execution of these fraud schemes” has grown substantially and that the Justice Department in the last year has charged 880 people with such crimes. WASHINGTON (ASSOCIATED PRESS) — An Internet connection and a bunch of stolen identities are all it takes for crooks to collect billions of dollars in bogus federal tax refunds. And the scam is proving too pervasive to stop. A government report in November said the IRS issued $4 billion in fraudulent tax refunds over the previous year to criminals who were using other people's personal information. Attorney General Eric Holder said this week that the "scale, scope and execution of these fraud schemes" has grown substantially and the Justice Department in the past year has charged 880 people. Who's involved? In a video message released ahead of the April 15 tax filing deadline, Holder said the scams "are carried out by a variety of actors, from greedy tax return preparers to identity brokers who profit from the sale of personal information to gangs and drug rings looking for easy access to cash." Even Holder isn't immune. Two men pleaded guilty in Georgia last year to trying to get a tax refund by using his name, Social Security number and date of birth on tax forms. The IRS says it opened nearly 1,500 criminal investigations related to identity theft in fiscal year 2013, a 66 percent increase over the previous year, and has strengthened filters that help detect where the scams are coming from. It says it stops far more fraudulent refunds than it pays out and is making a dent in the problem. Still, the schemes have grown more sophisticated, attracting criminals with violent backgrounds who see an easy and safe vehicle for theft, according to law enforcement officials who fear that not enough controls are in place. "I've been on calls with Alabama, Chicago, some other field divisions, where they're now experiencing people who were from Florida and now moving to other states to conduct this same type of fraud," said FBI Supervisory Special Agent Jay Bernardo, who works fraud cases in south Florida. "Based on the parameters that are in place now," he added, "it's very difficult to stop." What can taxpayers do? The most important step: Protect their Social Security numbers. Thieves steal Social Security numbers in any number of ways, including from publicly available sources or workplaces. Victims include school children, prisoners, Medicaid beneficiaries and the deceased. Criminals use the information to file false returns and then pocket the refund checks, often before the legitimate taxpayers have had a chance to submit their own returns. It's a crime made easier by electronic tax filing, which lets crooks mass-produce fraudulent returns. "Part of what's happening is people are reverse engineering," IRS Commissioner John Koskinen told a House committee this week. "You know, you file a thousand fraudulent returns and then you see which ones go through. ... They can adjust faster than we can adjust." In the latest sweep in south Florida, a hub for refund fraud, federal prosecutors last week announced charges against 25 people for using thousands of stolen identities to claim $36 million in fraudulent tax refunds. In one case, a middle school food services worker is accused of stealing students' personal information from an electronic database. In another, a jail guard is alleged to have stolen the identities of inmates and used the data to file false refunds. A mail carrier is accused of stealing tax documents out of people's mailboxes. In Washington, a barber shop owner pleaded guilty last year to running a $20 million fraud scheme that sought tax returns on behalf of nursing home residents, prisoners and the dead. Some people sold their own personal information, while others turned it over after being led to believe they were entitled to "Obama Stimulus Money" or an income tax refund. A Cincinnati woman pleaded guilty in January to submitting false tax returns on behalf of legitimate, unwitting businesses, using her laptop computer in a public library. A November Treasury Department inspector general report said fraudulent payouts over the previous year also went to addresses in Bulgaria, Lithuania and Ireland. In the U.S., more fraudulent refunds went to Miami than any other city. Assistant Attorney General Kathyrn Keneally, who heads the Justice Department's Tax Division, said refund fraud remains a serious concern but that authorities are "turning a corner" in their understanding of the crime and their ability to track down and prosecute fraudsters. "We're getting more and more sophisticated about how to catch it, how to stop it and how to prosecute it as we go on," she said. In Miami, law enforcement officials say they've been encouraging people and companies to better protect their information and have been targeting those who buy and sell personal data before any false return can even be filed. "That's the only thing we can do on our side, is just tell them be more cautious with your information," said FBI Assistant Special Agent in Charge Bill Maddalena.